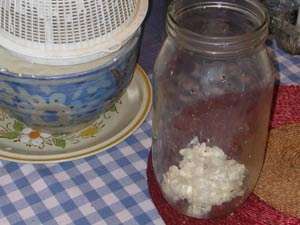 Kefir is a remarkable culture of about thirty beneficial microbes that is known to have been around for at least a thousand years. They live together in a special structure they create, it looks a little bit like like soft bits of cauliflower. They multiply at room temperature (between 18 - 30° C (65- 86° F) as they turn milk into kefir. 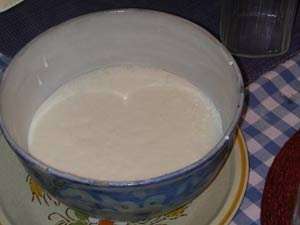 Drinking the cultured milk, called kefir, replenishes the intestinal flora as there are always small 'grains' of the kefir microbes passing over to the kefir solution. An improved intestinal flora will alleviate a lot of common ailments. Some scientific tests have shown that kefir can help to reduce cancer and eliminate Candida. A lot more information can be found at Dom's Kefir Website . 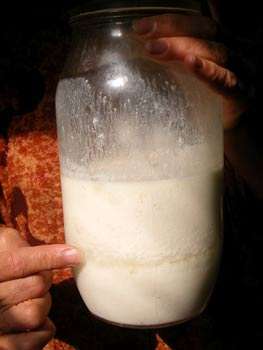 I do want to emphasize here that the fermentation of milk by the kefir culture creates a lot of enzymes, which are very important to our health. Read our Enzymes article. 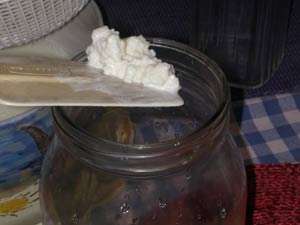 Kefir is a mysterious culture. The colony of microbes form themselves a matrix that is so unique it has its own name. 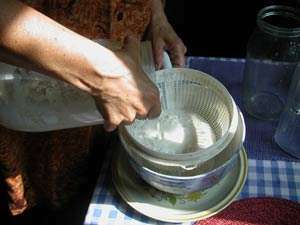 With other cultures, like yoghurt, one can always create a new culture by for example exposing milk to the air (the bacteria in the air enter the milk). But kefir is different. Scientists have never succeeded in recreating a new culture. The microbes never come together to form that unique matrix. Kefir can only be multiplied by dividing the existing culture. People have been dividing it for about a thousand years. 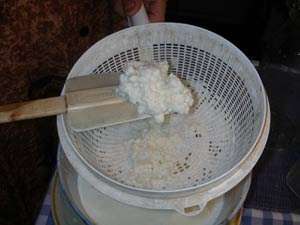 Here is a cultured milk ready to harvest, you can see how the milk is separating into curds and whey. You can let it go further, until there is a much more defined and clearer separation. I like it this way, but you have to find out just how you like it for yourself. The longer you let it go the tangier it will be. 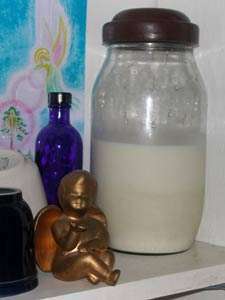 There is milk (kefir) on the glass on top of the jar because I swirled it around a couple hours before. 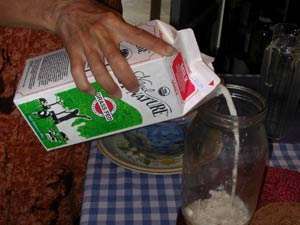 In the old times kefir was done in leather bags that were carried on the pack animals to keep them warm, and the culture was left in the bottom and milk replenished when needed. 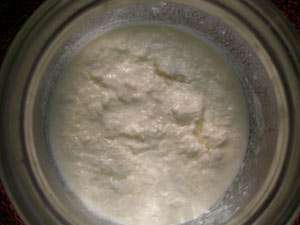 Planet kefir, view from the top, looking down into the jar. The curds tend to go to the top. 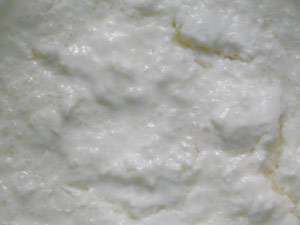 Close-up of kefir terrain. 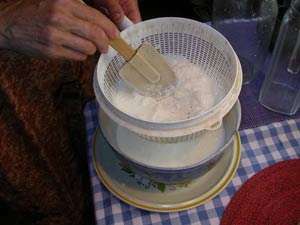 The curds and the whey (thinner part) will get mixed when you pour it. About to pour, you can see the kind of strainer I use, it works really well, it is plastic (no metal is to be used). The bowl is ceramic. The plate is for slops! Notice to the right is a second clean jar ready to go for the new batch and a glass pitcher for the kefir. I like to start in a clean jar. I have not been using any soap, just hot water. I don't want any soap residues in my batch. The use of metal is a debatable one. Dom's kefir site has an informative chapter about this issue. 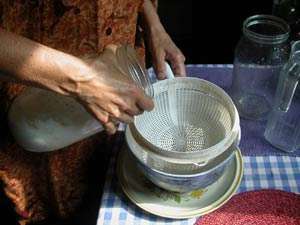 Pouring out the jar of cultured milk with the culture still in it. 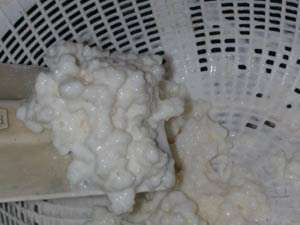 Close-up of the culture, I do not wash it in water, that is not necessary. I think the little guys are happier that way. The only time I wash it is if I am going to put it into the resting phase to save it give it away, or mail it to somebody. That has to be done in water. So, hopefully you are not confused. Just put the active culture you have just separated from the cultured milk you are going to drink, back into the clean jar. Hey, we're hungry! Where's our milk? Not in here... (this is the stuff I'm going to drink!) If I don't drink it all up now it goes in a pitcher and into the fridge. Whew, we want it right away. Starting the next batch. Depending on the room temperature, how much culture you have and how much milk you put in it will be ready in about 24 hours. Plus or minus. You have to get used to it, and develop your own rhythm. 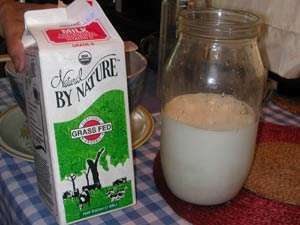 The best kind of milk around here, grass fed organic! In our little corner on the shelf, quiet, in the shade, never in the direct sun. 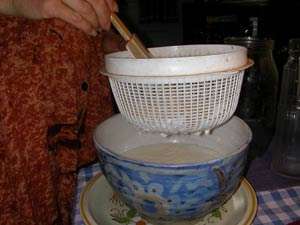 You might want to stir the milk a couple of times during the day, as the kefir culture tends to float to the top.